Unheard of, brave and so heart warming all at once, is the story of Canadian Tom Crist and his lottery win. While on a golfing holiday, Crist received news that he just became a winner of the Lotto Max lottery. What would one do with 40 million US dollars? Buy a house, a car or go on exquisite vacation? Instead, Tom decided to give all his winnings to charity, something no one expected.Tom became one of the little people who won such extremely lottery prize and kept to his basic living standards. Crist did not wish for a lifestyle upgrade or expensive cars, he decided to devote all his winnings to a cancer charity in memory of his late wife Jan who died of lung cancer in February 2012 at the age of 57. Tom explains that he did not want media or friends to know about his winnings simply because he does not want the attention or to be in public eye. ”I tell them they don’t need to meet me, because it’s not all about me being in the paper or on TV, I just want to help them and disappear”. Tom also feels that meeting cancer patients will refresh sad and surreal memories of the love of his life Jan, who lost her 6 year battle with cancer. Crist retired as the CEO of EECOL Electric in late September 2013 and is financially well off, able to look after himself and his children. “I don’t need that money” is what Crist is heard saying to press. Crist also reveals that he plans on creating a family trust where this money will be stored and his children will be able to withdraw these funds for the purpose of donating to their chosen charities. 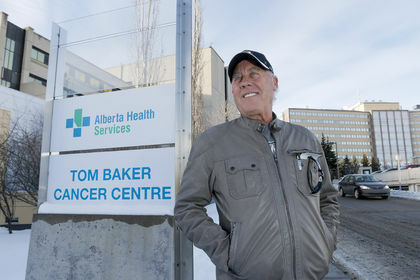 One of his charities of choice where he donated a large portion of his winnings is the Canadian Cancer Society and Calgary’s Tom Baker Cancer Centre in Canada. Play lotteries from all over the world with www.sun7lottery.com.